Lucinda Fredericks (AUS) and her gallant little mare Headley Britannia earned a standing ovation as they remained on their dressage score to win the Rolex Kentucky Three-Day Event, the first leg of the FEI HSBC FEI Classics™, in which Fredericks will now take pole position. Fredericks burst into tears as she left the arena and was greeted by her husband Clayton, who won this competition in 2007. The top three all jumped clear over Richard Jeffrey’s flowing track in Kentucky’s magnificent large arena, where the pressure on leading riders grew as the course was proving eminently jumpable and a mistake could prove expensive. Bettina Hoy (GER), gracious in defeat after her gripping battle with Fredericks, punched the air in delight as the 18-year-old Ringwood Cockatoo obliged with a clean round, just rattling one fence which luckily bounced in its cups. Buck Davidson (USA), 33, scored his best ever 4-star result, third on his exciting new ride My Boy Bobby. Tim Lips (NED), who had impressed during the weekend, slipped from 4th to 9th with two rails down, at 12 and 13c, but he won the HSBC FEI Classics™ Training Bursary worth $1,000 awarded to the highest placed rider competing at their first 4-star. It was an international line-up. Nicolas Touzaint (FRA) and Hildago de l’Ile, winners of last year’s Mitsubishi Motors Badminton Horse Trials, remained on their dressage score to move up to 4th place. Lucy Wiegersma (GBR), runner-up to Touzaint at Badminton last year, was 5th on Woodfalls Inigo Jones with a clear round. Her compatriots William Fox-Pitt (GBR) on Seacookie and Oliver Townend (GBR) who, frustratingly had the last fence down on Carousel Quest, finished 6th and 8th, split by last year’s winners, Phillip Dutton (USA) on Connaught, 7th. Wiegersma, Fox-Pitt and Townend all have rides at the second leg of the HSBC FEI Classics™, the Mitsubishi Motors Badminton Horse Trials (GBR) in a fortnight’s time and, therefore, the chance to improve on their status in the rankings. Richard Jeffrey (GBR), who has been designing the stadium tracks at Kentucky since it gained 4-star status in 1998, set a thought-provoking test for riders. Many were seen worriedly walking an interesting line from 6, which was followed by a left-hand turning loop to 7 where there were two alternatives. The obvious line looked to be to the left-hand side of 7, but in order to get the best possible line for 8, an extra time-consuming curve to the right was required. Both routes jumped well, as did the whole track. Headley Britannia must be one of the most successful Eventing mares ever. In 2007, she was the first mare to win the Mitsubishi Motors Badminton Horse Trials in 53 years; in 2006, she was the first mare to win the Land Rover Burghley Horse Trials since Mark Phillips’s Maid Marion in 1973. Now, she follows Primmore’s Pride, ridden by Pippa Funnell (GBR), in winning at Kentucky as well. Headley Britannia is by the part Irish Draft stallion Jumbo out an American Thorougbred mare, Alan’s Bambi. She was bred by Mike and Betty Hounsell at Headley Stud in Berkshire, England. Headley Britannia first sprung to prominence when winning the Blenheim CCI*** (GBR) in 2002. She and Lucinda were members of Australia’s Olympic silver medal team in 2008. Headley Britannia has had a foal by embryo transfer, by the jumping stallion Jaguar Mail. Lucinda Fredericks, 43, switched to Australian nationality, in 2002. She lives near Devizes, Wiltshire, England with her husband Clayton and daughter Ellie. She also competes in Dressage to Grand Prix level. Bettina Hoy has been a prominent member of the German Eventing team since 1982. She won an Olympic team bronze medal at Los Angeles (USA) in 1984 and was European Champion in 1997 on Watermill Stream. Some of her best results have been with Ringwood Cockatoo, an Irish-bred thoroughbred, who was previously ridden by her husband, Andrew. The horse was given to Bettina at the end of last season, following their triumph at Les Etoiles de Pau. 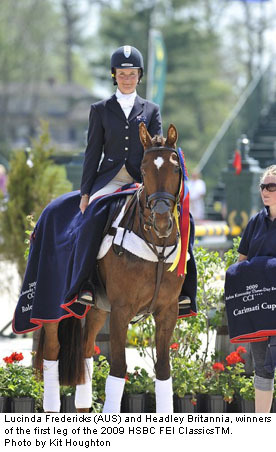 Bettina has also won at Luhmuhlen on this horse and was a member of the 4th-placed German team at the 2004 Olympic Games. She won team bronze at the 2005 FEI European Eventing Championship at Blenheim (GBR), plus team gold at the 2006 FEI World Equestrian Games in Aachen and an individual bronze medal at the 2007 FEI European Eventing Championship at Pratoni del Vivaro (ITA) in 2007. Hoy, 46, lives with her husband Andrew, a triple Olympic gold medallist, in Warendorf, Germany. She finished fifth in the 2008 HSBC FEI Classics™. Bruce Davidson Snr, to whom America owes the formation of the Rolex Kentucky Three-Day Event – the country was awarded the 1978 World Championships thanks to Bruce’s victory in 1974 – has been immortalised with a wonderful statue of himself riding across country on Eagle Lion. Bruce won the 1978 World title at Kentucky, on Might Tango, and has been synonymous with the event ever since, winning the Rolex Trophy at Kentucky in 1983, 1984, 1988 and 1989 and competing here on most occasions over the last 30 years. He finished 19th on Cruise Lion. The 17-year-old Kentucky Thoroughbred, who was a great servant to the US Eventing team, performed a retirement parade with his rider, Amy Tryon (USA). Poggio won World team gold in 2002 and produced one of only two double clears at the Athens Olympics in 2004 to help the US team to bronze. At the 2006 FEI World Equestrian Games in Aachen (GER), his outstanding jumping performances were rewarded with an individual bronze medal.